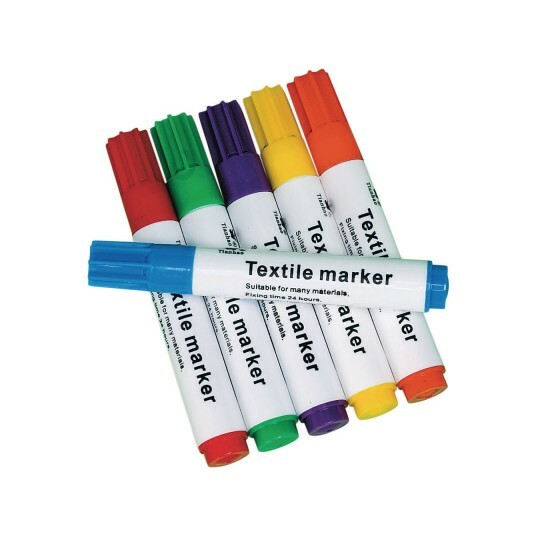 Color Splash!® Fabric Markers have smooth broad line felt tips and child-safe caps. Set contains one each of 6 vibrant colors: red, blue, green, orange, yellow, and purple. Easily layer colors without muddy color mixing. Markers work on a variety of surfaces: fabric, non-woven fabric, foam, paper, nylon, vinyl, wood, and plastic! Even works great on dark/black surfaces. AP certified and non-toxic. These fabric markers are so fun to work with! The colors are vibrant and they go on so easily. Be sure to put cardboard or wax paper under the fabric when coloring the paint can seep through. We used these to write our library name on design your own backpacks. It was an inexpensive and much easier solution and alternative to iron-on letters etc. We let the children write their names on their backpacks and they were easy to use for them also. The cost for similar markers was nearly twice as much at a local craft store.